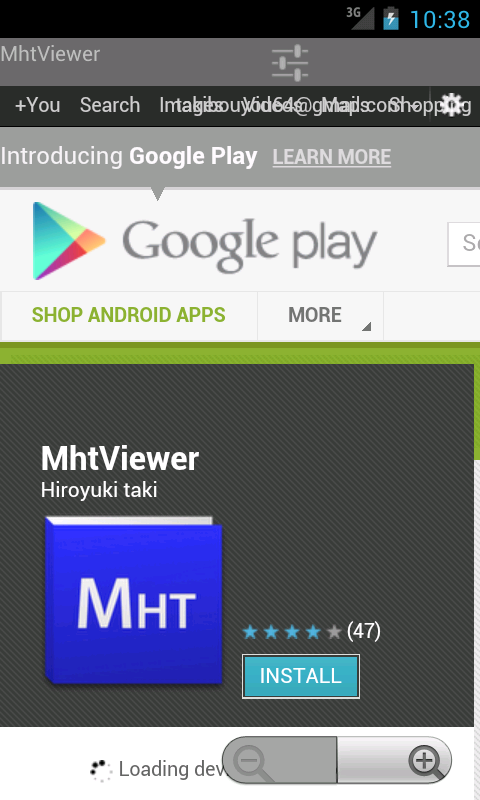 MhtViewer is a viewer of the archive file of a Web page created by MHTML form. It is software for Android. It was created in order to read the mht file of a long sentence. Support has ended. Please use the following apk if necessary. MhtViewer does not correspond to the attached file of e-mail. I do not support because a side effect is too strong. (If the attached file of e-mail is chosen, MhtViewer will serve as a candidate for selection by all the files.) 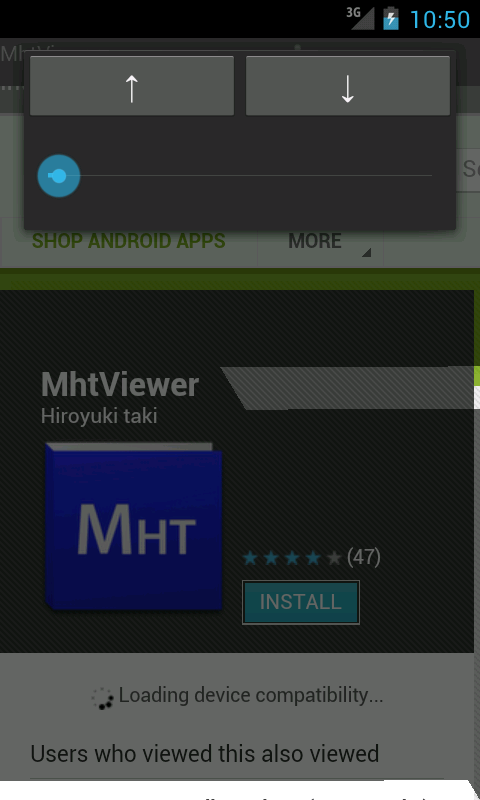 Please start MhtViewer after you save a file attachment. Unless url() is used at the time of import of css, it is not reflected when the directory is specified as css of the import point. Been no support for multiple tabs UnMHT. 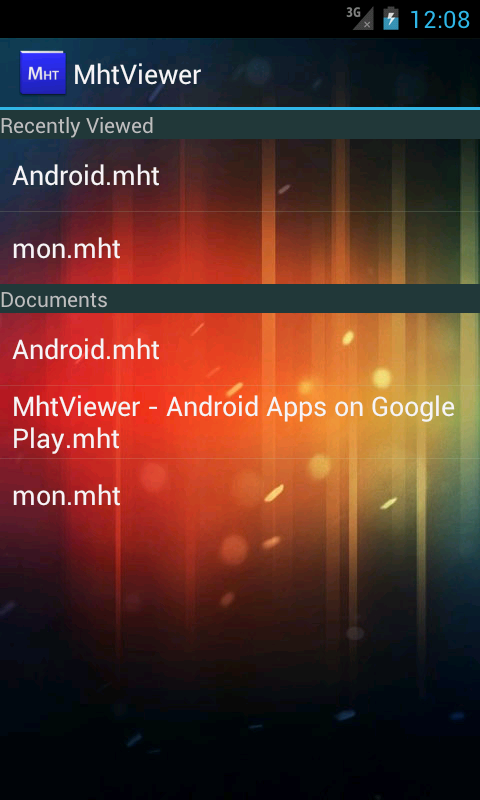 1.0.8 Fixed a text description of the mht file home directory does not. 1.0.7 Fixed crash in specific file events. 1.0.6 Fixed crash during the file load events. 1.0.5 Fix the long file names in the directory selection screen, if you omit the file name. 1.0.5 Response to the events of the press back during the process to crash when viewing the Recently Viewed. 1.0.4 Modified to display the file name in the directory selection screen. 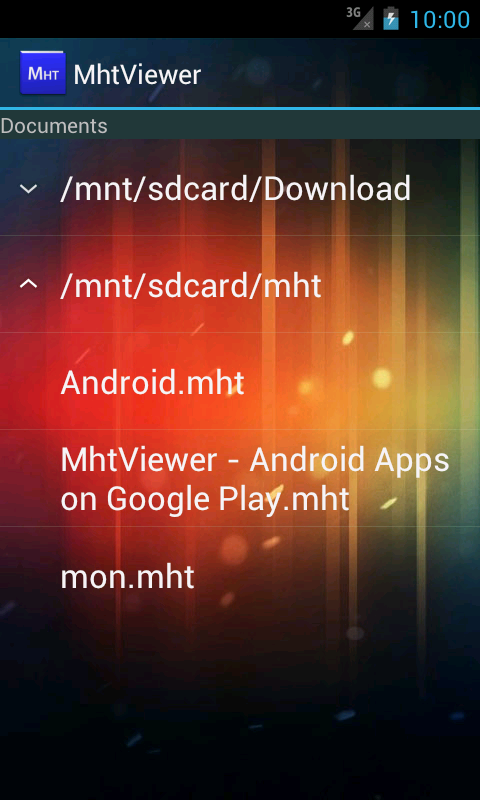 1.0.4 It supports extension mhtml. 1.0.4 Minor improvements of internal processing. 1.0.3 Modified so that it can change the sorting method for a list of documents. 1.0.3 Modified to sort by name the default sorting method. 1.0.3 Modified of the wording. 1.0.2 When setting the home directory, pressing the UP button in the top-level directory, corrected for reaction events is lost. 1.0.0 Modified so that it can set the home directory specified in the dialog. 1.0.0 Not only the hierarchy under the home directory, added as a folder home directory to search for himself. 0.9.27 When charset of html and different charset are specified before html, it corresponds to the phenomenon which garbled characters generate. 0.9.27 The treatment of the last file corresponds to the phenomenon (a picture etc. are not displayed) which becomes imperfect. 0.9.26 Correspondence to the case where boundary changes and returns. 0.9.25 If you select a folder other than their own cache, fix the problem had been file not found. 0.9.25 Erasable individually modified to the cache when the cache click the field long. 0.9.24 Minor fixes for layout, Other minor fixes are part of. 0.9.23 Correspondence to the case where boudary changes in the middle of a file. 0.9.23 Correspondence to the case where there is no html in the head of a file. 0.9.22 When a file does not exist, it corrects about the phenomenon which carries out an abnormal end. 0.9.21 It corrects so that charset encoding can be changed after a display (experimental function).